Now and then I thought I'd write about books that have inspired me or taught me something that I carry with me. Sometimes a book illustrates a way to live that makes me think-- hey I could do that. Sometimes it shows me how to get from here to there. The first book from my shelves is the latter type. It's a mystical story of the adventures of an Andalusian shepherd boy. In 'The Alchemist" by Paulo Coelho each of the events in the boy's life illustrate how we can follow our own dreams. The story begins as all good ones do with Santiago living his life in the hills and tending his sheep. He knows why he is where he is, but he has simple dreams and understands the importance of dreams that come true. In great stories, there is usually a gatekeeper or an initiating event that thrusts the hero or heroine from their safe niche and into another world. In this case, Santiago's adventure begins with dreams he cannot interpret, and he uneasily visits a gypsy for help. She says something so great: "And dreams are the language of God. When he speaks in our language, I can interpret what he has said. But if he speaks in the language of the soul, it is only you who can understand." Through what she tells him, he begins his quest . It seems what he is searching for is a treasure but in reality it's his own personal destiny. Each person and event along the way teaches him more about himself and how life works. 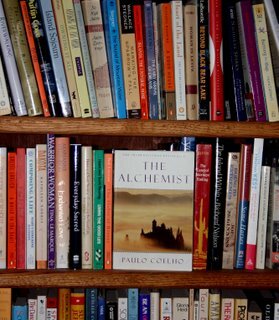 The Alchemist is a simple story, not very long and despite the fact it has many mystical truths (not to mention great quotes) imbedded within, it also is a story that stands on its own as an adventure that keeps you turning the pages to see what he will learn next, what will happen to him, and will he find a treasure? The story vividly illustrates how omens can help us as we learn to recognize and interpret them. How many of us have events occur, see omens that we know are beyond the norm but we talk ourselves out of looking for their meaning? We convince ourselves they were nothing. Secretly inside, we know that was not so, but because we fear the cost of venturing off the beaten path, we ignore any sign that might make us question. After all, what if the price is too high? What if following our destiny disrupts our lives and it was all for a lie? I think such concerns are pretty universal as there is no doubt that to look for omens can lead to a hard time as it did for the shepherd boy (can lead others to think you are crazy also). The boy's experiences were dangerous, costly, but also beautiful and gave him a sense of purpose. He had to learn to trust not only in himself but in the greater meaning to life. If we believe our life has no special purpose, we will not look for meaning in the events that come our way. We could be hit over the head with destiny and we will ignore it. On the other hand, if we see all of life as aimed at leading us to our own unique purpose, we will watch what occurs with an awareness that might lead us to our own treasure. "The old man had spoken about signs and omens, and, as the boy was crossing the strait, he had thought about omens. Yes, the old man had known what he was talking about: during the time the boy had spent in the fields of Andalusia, he had become used to learning which path he should take by observing the ground and the sky. He had discovered that the presence of a certain bird meant that a snake was nearby, and that a certain shrub was a sign that there was water in the area. The sheep had taught him that. "If God leads the sheep so well, he will also lead a man, he thought, and that made him feel better." I'll agree with what the two comments before me have said. I enjoy reading your blog in no small part due to the broad subject matter you talk about. And you do it so well. Thank you and please keep on doing what you are doing. that makes it unanimous, you write about such a broad spectrum of topics that a person is constantly learning something new from you or looking at something differently. I know that we talk quite a bit but I never tire reading anything that you have written and I doubt that I ever will. 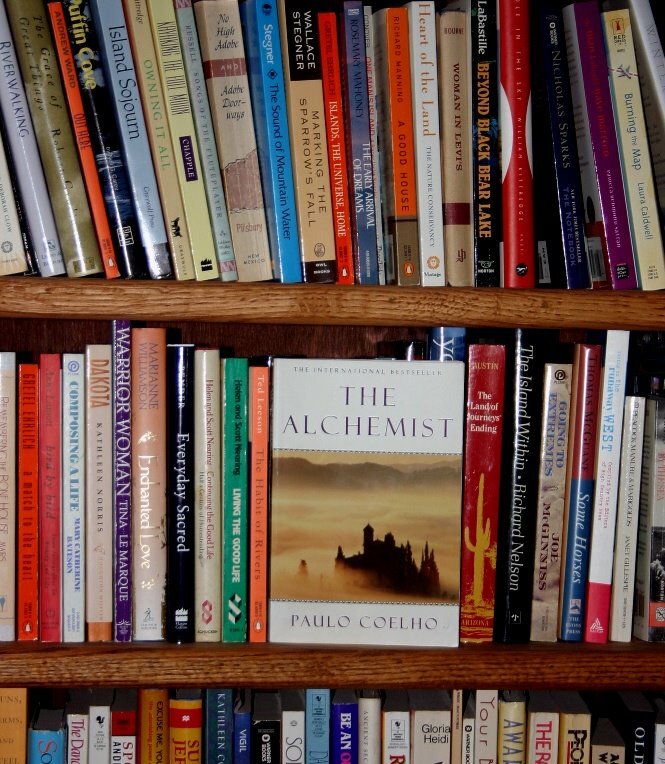 I have not read The Alchemist but you've made me want to pick up a copy! Someone recommended this book recently and I meant to get it--and then forgot. I understand that Costco has it discounted. Given your review--and the subject material which you know I will find right down my alley--I'll make sure I have it on my carry-on Tuesday when I fly to Seattle. If we still have carry-ons. Destiny is an effect and cause principle. Me writing to you is bound by the effect i had viewing your blogs. The effect is caused not only by your blogs it's also the cause of total effects i had in my life. I'm so glad I mentioned that book to you recently. Because I wasn't reading your blog last Aug. so thanks for the link back. I thoroughly enjoyed your review and now.....I think I need to put aside the mediocre book I'm half way through (and struggling with) and pick up my copy of The Alchemist. Thanks for a superb review, Rain!